One can follow a new path without knowing where it will lead, or start a new adventure without knowing how it will end. At the start of the 2000s, nobody could have imagined that the curator of the exhibition ‘Enchanted by Fire’ – the Finnish sculptor and designer Pekka Paikkari would stand in the middle of the storage room of ceramic sculptures in Kohila in Estonia just 15 years later, admitting that the collection was unique almost in the whole of Europe. There are outstanding collections of ceramic sculptures in Guldagergaard, Denmark; Kecskemét, Hungary, and Paneveěys, Lithuania, but none of them are comprised entirely of wood-fired ceramics. Moreover, it is unexpected to find such a collection in a country which has no stoneware clay deposits, and where traditional pottery has never played too important a role. But let’s go back to the beginning. It was in the 1990s, when Estonia restored it’s independency; the ‘iron curtain’ had crumbled into dust, and newly opened borders enabled artist and student exchanges, that the first contacts between the departments of ceramics of North Carolina University (USA) and the Estonian Academy of Arts were established. Richard Spiller, the then ceramics professor at NCU initiated the first contact. Richard, together with Andres Allik, the Estonian kiln master who was at the time at the start of his career, had the idea of building a large anagama with the goal of popularising wood-firing in Estonia. An intense fundraising period followed, where the crucial contribution was made by potters from the Seagrove Pottery Village (USA). 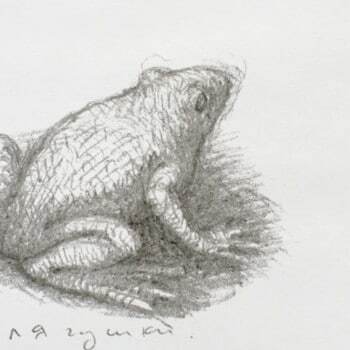 Nancy Gottovi (partner of the potter David Stuempfle from Seagrove), supported the grant application made to an international arts organization based in the USA. 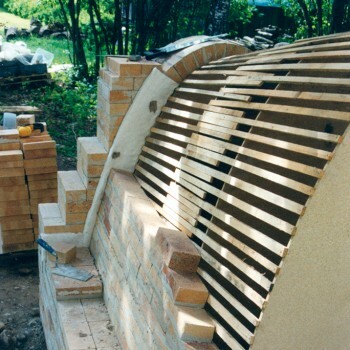 In 2000 a group of potters from Seagrove and their Estonian colleagues spent several weeks building the combined anagama/groundhog type kiln, known as the ‘Esthoggama’, in the Tohisoo Manor Park in Kohila. At that time, wood-firing had not been totally forgotten in Estonia. Like a Sleeping Beauty, it made its first movements after long years of sleep. Following the Soviet occupation period during which all the old wood-fire kilns had been replaced by electric ones in the modernization process, the first smaller privately owned wood-fire kilns had been constructed. Though the circle of ceramicists who were attracted to wood-firing wasn’t especially wide, a desire for an international ceramics workshop was in the air. The idea was realized by Andres, who took the initiative of organising the first international wood-fire symposium in 2001. Since 2002 the Estonian Ceramists Association has supported the organisation of this annual event. Andres has been the kiln master for most of the symposia, and the organisational work was carried out by Aigi Orav and myself, together with several volunteers. The event has developed during the years and has found its own rhythm and characteristic features. The symposium focuses on producing wood-fired sculptures and each participant has to create at least one large-scale piece during the event. Participants are always selected from different countries, taking into account the balance between established artists and young promising talents, and men and women. 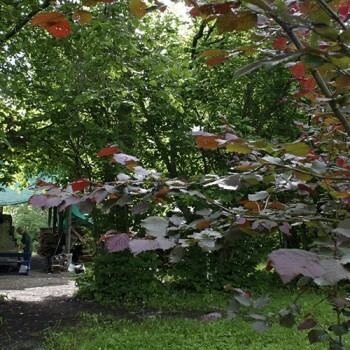 Up to 13 artists work and live together for three weeks in Tohisoo Manor, in June – July each year. This is the most beautiful time of year in Estonia – so kiln watching during our short summer nights, with early sunrise, is an unforgettable part of the memories from Kohila. Time spent together – working, relaxing, partying – give an extra shade to the colourful palette of the whole event. The craft skills of working with clay and firing a wood-fire kiln are employed here in the service of modern art. The synthesis of ideas, experiences and knowledge shared during the symposia is reflected in the work of the participants and, through them, spreads all over the world, without recognizing any borders. Over the past 15 years, 158 ceramic artists and sculptors from 26 countries have participated in the symposia. 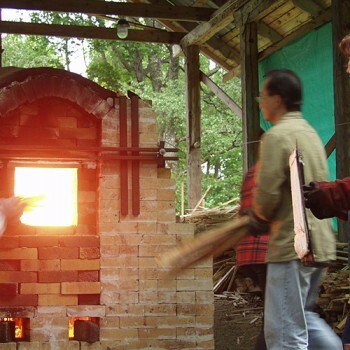 The modified anagama-type kiln is the heart of the event. With its packing capacity of 3.5 m3 it is one of the biggest – both in the Baltic countries as well as in Scandinavia. It allows pieces up to 130 cm in height to be fired. 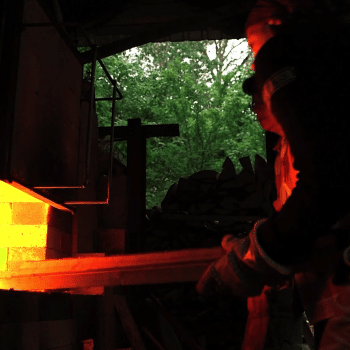 The firing lasts from 30 – 38 hours to achieve a temperature of 1300ºC – 1320°C throughout the kiln, using about 4 m3 of firewood – mainly pine offcuts from local sawmills. 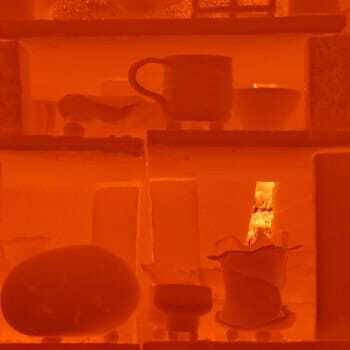 Salt, soda, and sometimes wheat bran are introduced to the kiln at high temperatures to create special surface effects. After 97 firings the original kiln underwent in-depth reconstruction in 2014. 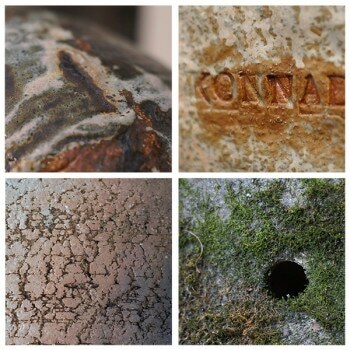 A campaign ‘My Brick for Kohila Kiln’ was conducted by the Estonian Ceramists Association. People joining the campaign had an opportunity to buy virtual bricks by making donations. Another kiln, a bourry-box type, was built onto the other side of the anagama chimney in 2012, by the ceramic students of the Estonian Academy of Arts, the Art Academy of Latvia, and HAMK University of Applied Sciences, Finland, during a project called ‘EcoCeramics’. Each year at the end of the symposium, participants display their work in an open air exhibition, and every five years, some of the newest works in the collection are shown in a larger survey exhibition in Tallinn. In 2015, to celebrate the 15th anniversary of Kohila Symposia, a large jubilee exhibition took place in Tallinn Art Hall. The Estonian Ceramists Association invited Pekka Paikkari, an internationally recognised Finnish artist to curate the exhibition. Having taken part in the symposium in 2002, Pekka was not aware of the developments that had occurred since then, and got a big surprise when he saw a collection of ceramic sculpture that every ceramic centre would be proud of. Inspired by the size and variety of the collection, Pekka, together with his helper Mari Paikkari, and the local design studio Laika, Belka & Strelka, arranged the design of the exhibition. As there have been so many good artists taking part in the symposia during the past 15 years, it was a hard task to select the lucky ones, 78 in total, whose work was exhibited. The entire wall in the entrance hall was covered with pages from the firing logbook, copied onto very thin paper. A light breeze, caused by people passing by, resulted in sheets moving mysteriously. Observing these pages one could read not only technical information about the firings, but also plenty of little funny messages in different languages, and see drawings made by various artists. The elaborate artistic logbook has become one of the characteristic features of Kohila Symposium. Despite the solid weight of most of the large clay sculptures exhibited in the main hall, there was an overall impression of lightness, thanks to the light but stable plywood stands. The mural in the same room, specially painted for the exhibition by Sergei Isupov (and washed off afterwards), illustrated the dramatic character of the wood-firing process, expressing the beauty and sumptuousness of ephemeral art. The wood-firing aesthetics can be especially well observed in surfaces, shades and cracks of these small objects. 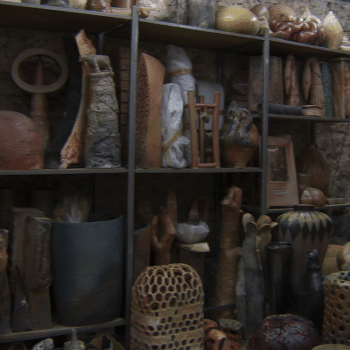 Even a disaster in the kiln – collapsed shelves – can create an enjoyable piece of art, if one has an eye to see it. Pekka stated: ‘I think that the soul and originality of the materials are hidden in the cracks. Flaws, cracks, and breaking – these are things that I play with in my practice … when something cracks and breaks, it is moving. 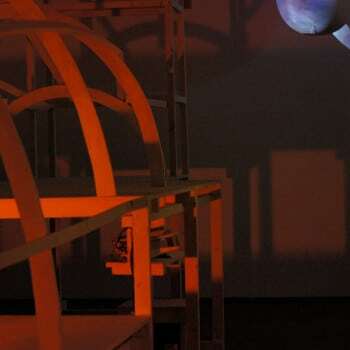 When it is broken, the movement ends, the tension disappears.’ The same aesthetics was found in a small dark room, where the light was focussed onto a couple of very fragile, almost gossamery experimental objects by Ray Chan See-kwong from Hong Kong. Having walked through the exhibition the visitor was met by a surprise in the last room, where they faced the installation by Urmas Puhkan. This completed the exhibition with an exact model of the Kohila kiln, and a video showing the firing process. Recorded sounds from the firing, together with colours of flickering flames gave an impression of the firing process and re-created a special, captivating atmosphere of wood-firing, which has been enchanting for so many artists all over the world – people enchanted by fire. Kohila Symposium has become one of the connecting links between these people, a part of the worldwide network of wood-firers. Külli Kõiv graduated from the Estonian Academy of Arts (ceramics) and is a founder member of the Asuurkeraamika studio (www.asuurkeraamika.ee). She has been the leader of the Estonian Ceramists Association from 2012 – 2015 and an organizer of the Kohila International Ceramics Symposium since 2002. She lives and works in Tallinn, Estonia.